As a follow up to yesterdays post of a hand knitted green top, here is a picture of another top that my friend has knitted. This time she has chosen many different colors that go together. I think this top look pretty good too. 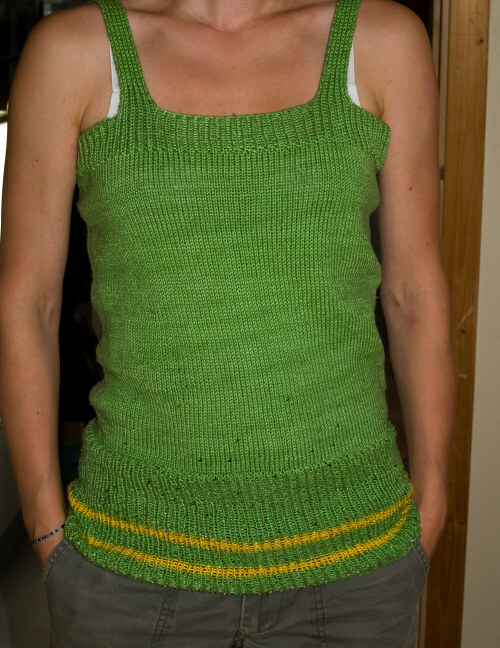 Here is a picture of a green top that a friend of mine knitted. I think it look pretty darn good! It might be hard to see in the picture, but she knitted some small pearls into the top to add an extra touch. Together with the yellow stripes this top is really unique. Who need H&M when you can knit such beautiful clothes. Here is a picture of one of my older projects. It is a beanie hat that I knitted last year and I just took it out from storage because it is getting colder. 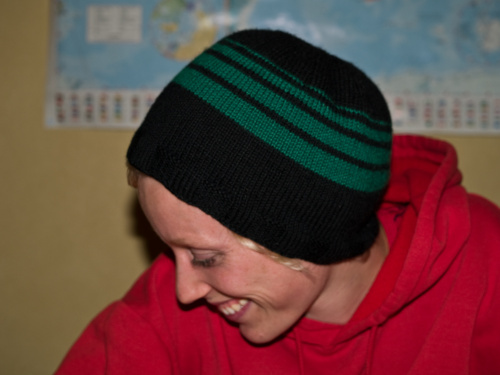 When I started knitting this beanie I didn’t have a plan, but when I was half way I found some green yarn that I thought would fit. I’m pretty satisfied with the green stripes and the end result, but maybe the stripes should have been a bit further down on the hat? A big thanks to the kind girl that posed with the beanie hat. A friend of mine decided to do something with her very worn out socks. 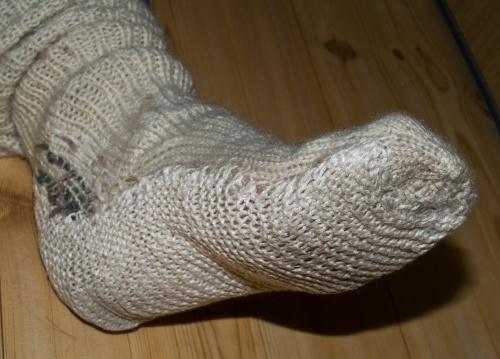 An easy way to fix socks with big holes is to just knit a sole and then sew if over the holes. 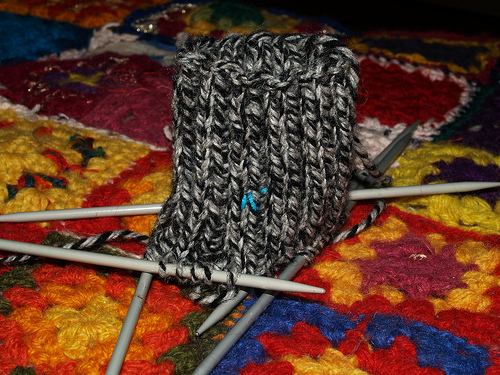 Of course the best way to avoid big holes is using yarn that is suitable for socks. These socks were made of pure organic wool so it is not a big surprise that they wore out fast since wool is not really durable in socks. 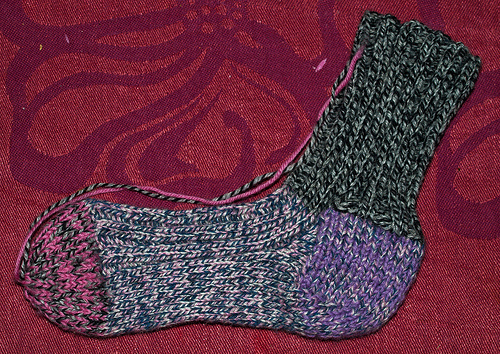 When I knit warm socks like these I usually use yarn that is designed for socks and I use an extra thread in the heel and the toe to make them even more durable. Five days ago I posted a picture of a ragg sock that I just had started to knit. Yesterday I finished one of the socks (takes a bit time for me to finish a knitting project because I am distracted by so much else), but it turns out my brain did not remember my old sock pattern and the sock turned out to be a bit too small for me. 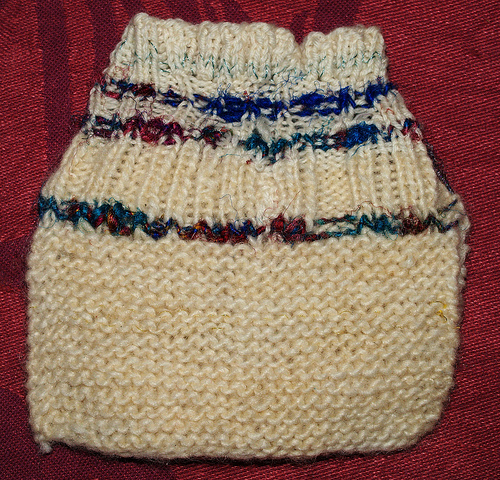 Yeah, I know I should have measured if the sock would fit me while I was knitting, but I was so sure I knew how many rounds I had to knit. Here is a picture of one of the socks. Just started on the other one. One of my friends in the collective I live in is crafting a lot of different stuff. Here is a picture of a “doll neck” (not sure if it is called this in English) she has knitted for her kids dolls. Knitting such doll clothes is very easy, cheap and the kids love it. It is also a great way to use leftover yarn as the doll clothes doesn’t have to look perfect. Later on I will post more stuff that she has crafted. Winter is getting closer and the air definitely has an autumn feel to it. It is about high time that I start getting ready for the colder seasons. Today I started on some warm, black socks, or they are black so far. Who knows what kind of colors I will include later on (I love knitting without a strict pattern). 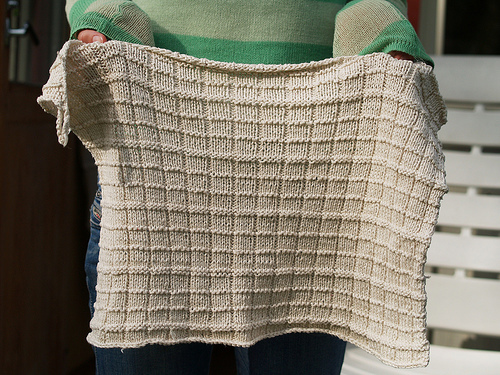 Here is a picture of a hand towel that a girl in my collective has knitted. I think it looks really cool with the way she knitted squares into it. She knitted it out of plain white cotton so it will be nice and soft. Knitting stuff like hand towels is a part of the plan, in our household, to create much of the stuff that we need.